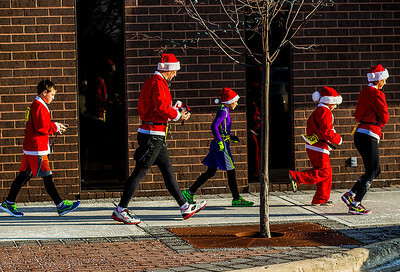 Kyle Grillot - kgrillot@shawmedia.com The Deweerdt's of Hoffman Estates (from left) Jack, 12, Jeff, Ben, 10, Sam, 8, and Stacey, rush towards Williams Street before the start of the 2013 Kiwanis Santa Run in Downtown Crystal Lake. Proceeds from the race go towards Turning Point Big Bros & Sis, CASA Light Center Foundation, Main Stay, Girls on the run and Kiwanis of MCCO. 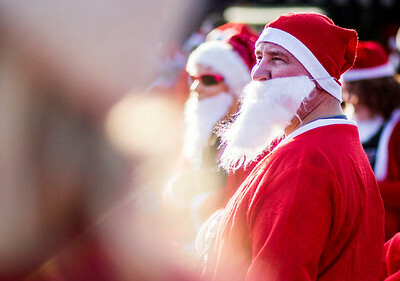 Kyle Grillot - kgrillot@shawmedia.com Sam Deweerdt, 8, of Hoffman Estates waits on Williams Street before the start of the 2013 Kiwanis Santa Run in Downtown Crystal Lake. Proceeds from the race go towards Turning Point Big Bros & Sis, CASA Light Center Foundation, Main Stay, Girls on the run and Kiwanis of MCCO. Kyle Grillot - kgrillot@shawmedia.com Dave Johnson of Huntley holds his daughter Annabel, 10, before the start of the 2013 Kiwanis Santa Run in Downtown Crystal Lake. Proceeds from the race go towards Turning Point Big Bros & Sis, CASA Light Center Foundation, Main Stay, Girls on the run and Kiwanis of MCCO. Kyle Grillot - kgrillot@shawmedia.com Kevin Grant of Crystal Lake listens to the playing of the Star Spangled Banner before the start of the 2013 Kiwanis Santa Run in Downtown Crystal Lake. Proceeds from the race go towards Turning Point Big Bros & Sis, CASA Light Center Foundation, Main Stay, Girls on the run and Kiwanis of MCCO. 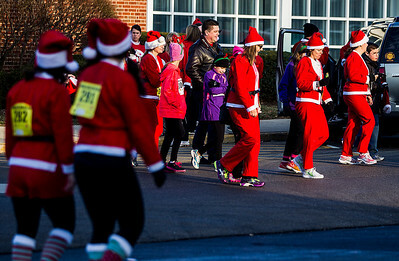 Kyle Grillot - kgrillot@shawmedia.com Runners advance down North Williams Street just after the the start of the 2013 Kiwanis Santa Run in Downtown Crystal Lake. Proceeds from the race go towards Turning Point Big Bros & Sis, CASA Light Center Foundation, Main Stay, Girls on the run and Kiwanis of MCCO. 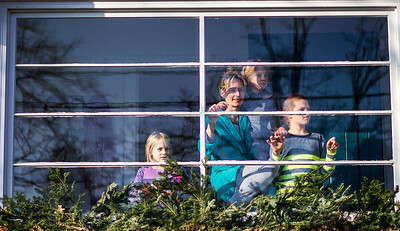 Kyle Grillot - kgrillot@shawmedia.com Courtney Macke (center) watches the race with her children Ruby, 5, (left) Buzz, 10, right, and Emma, 7, during the 2013 Kiwanis Santa Run in Downtown Crystal Lake. Proceeds from the race go towards Turning Point Big Bros & Sis, CASA Light Center Foundation, Main Stay, Girls on the run and Kiwanis of MCCO. 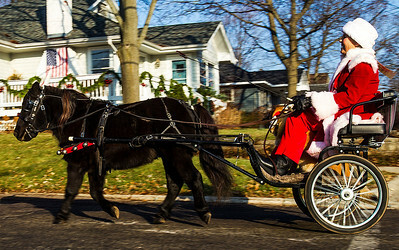 Kyle Grillot - kgrillot@shawmedia.com Carol Swinford of Hebron rides behind Buddy the falabella miniature horse, during the 2013 Kiwanis Santa Run in Downtown Crystal Lake. Proceeds from the race go towards Turning Point Big Bros & Sis, CASA Light Center Foundation, Main Stay, Girls on the run and Kiwanis of MCCO. 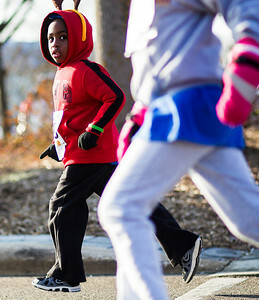 Kyle Grillot - kgrillot@shawmedia.com William Ogonga, 4, of Crystal Lake looks to his competition during the 2013 Kiwanis Santa Run in Downtown Crystal Lake. Proceeds from the race go towards Turning Point Big Bros & Sis, CASA Light Center Foundation, Main Stay, Girls on the run and Kiwanis of MCCO. 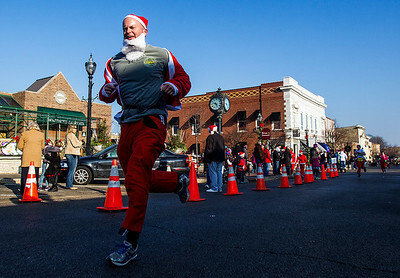 Kyle Grillot - kgrillot@shawmedia.com John Verchoto of Crystal Lake advances down North Williams Street towards the finish line during the 2013 Kiwanis Santa Run in Downtown Crystal Lake. Proceeds from the race go towards Turning Point Big Bros & Sis, CASA Light Center Foundation, Main Stay, Girls on the run and Kiwanis of MCCO. 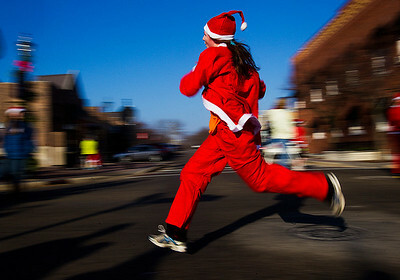 Kyle Grillot - kgrillot@shawmedia.com A runner advances down North Williams Street towards the finish line during the 2013 Kiwanis Santa Run in Downtown Crystal Lake. Proceeds from the race go towards Turning Point Big Bros & Sis, CASA Light Center Foundation, Main Stay, Girls on the run and Kiwanis of MCCO. 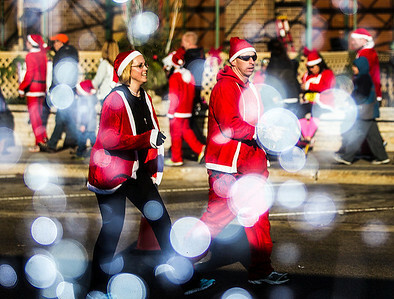 Kyle Grillot - kgrillot@shawmedia.com Kristen Carlstedt (left) and Bryan Bode both of Crystal Lake advance down North Williams Street towards the finish line during the 2013 Kiwanis Santa Run in Downtown Crystal Lake. Proceeds from the race go towards Turning Point Big Bros & Sis, CASA Light Center Foundation, Main Stay, Girls on the run and Kiwanis of MCCO. 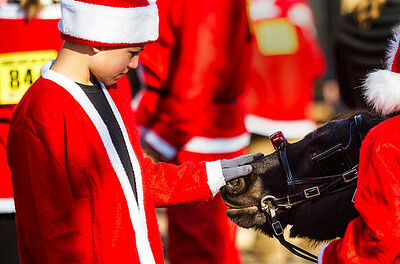 Kyle Grillot - kgrillot@shawmedia.com Jack Deweerdt, 12, of Hoffman Estates pets Buddy the falabella miniature horse, after the 2013 Kiwanis Santa Run in Downtown Crystal Lake. Proceeds from the race go towards Turning Point Big Bros & Sis, CASA Light Center Foundation, Main Stay, Girls on the run and Kiwanis of MCCO. 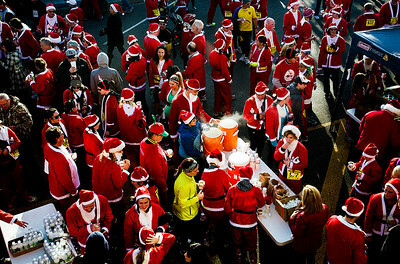 Kyle Grillot - kgrillot@shawmedia.com Race participants gather for snacks and refreshments in front of the Raue Center for the Arts during the 2013 Kiwanis Santa Run in Downtown Crystal Lake. Proceeds from the race go towards Turning Point Big Bros & Sis, CASA Light Center Foundation, Main Stay, Girls on the run and Kiwanis of MCCO. 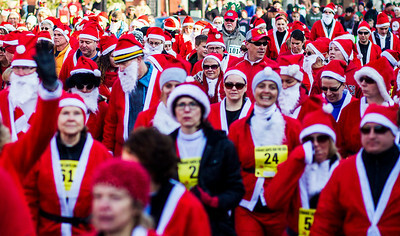 Kyle Grillot - kgrillot@shawmedia.com Race participants head towards the starting line before the 2013 Kiwanis Santa Run in Downtown Crystal Lake. Proceeds from the race go towards Turning Point Big Bros & Sis, CASA Light Center Foundation, Main Stay, Girls on the run and Kiwanis of MCCO. 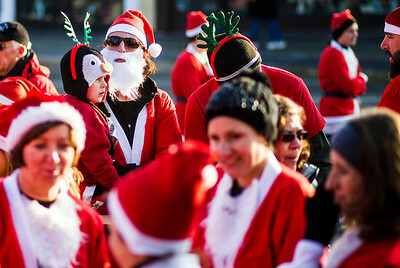 Kyle Grillot - kgrillot@shawmedia.com Beth Irwin of Genoa City, Wis., (top-left) holds her son Jacob, 4, before the start of the 2013 Kiwanis Santa Run in Downtown Crystal Lake. Proceeds from the race go towards Turning Point Big Bros & Sis, CASA Light Center Foundation, Main Stay, Girls on the run and Kiwanis of MCCO. 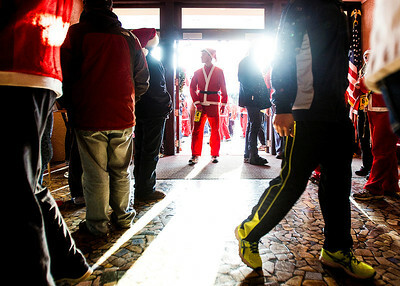 Kyle Grillot - kgrillot@shawmedia.com Race participants gather in the Raue Center for the Arts for their race packets and shelter before the start of the 2013 Kiwanis Santa Run in Downtown Crystal Lake. Proceeds from the race go towards Turning Point Big Bros & Sis, CASA Light Center Foundation, Main Stay, Girls on the run and Kiwanis of MCCO. 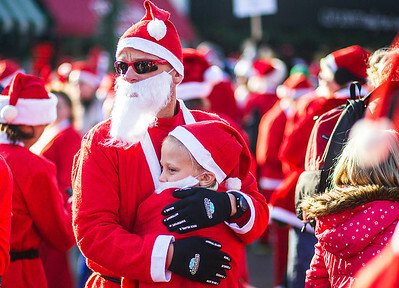 Beth Irwin of Genoa City, Wis., (top-left) holds her son Jacob, 4, before the start of the 2013 Kiwanis Santa Run in Downtown Crystal Lake. Proceeds from the race go towards Turning Point Big Bros & Sis, CASA Light Center Foundation, Main Stay, Girls on the run and Kiwanis of MCCO.